Everyone knows Kendrick Lamar is a genius. The rapper, better known as “King Kendrick,” has revolutionized the world of music, and seems poised to take over the world. Obviously, King Kendrick has a lot to teach us about music. However, this musical icon also has plenty to teach us about money. 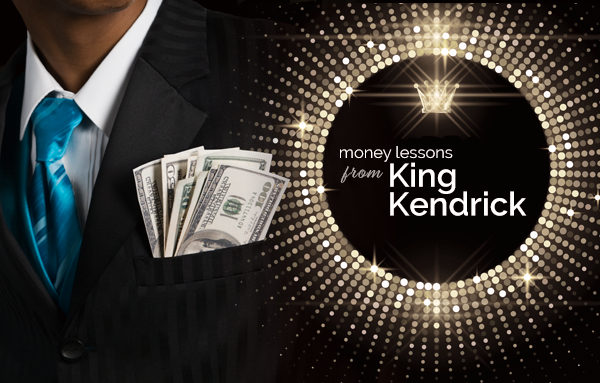 Here are just a few money lessons we can all learn from King Kendrick. King Kendrick understands a pretty fundamental lesson: building wealth takes time and dedication. He grinds 24/7 on his tours (for instance, he had twenty-six performances in 2015 alone) because he knows it’s the best way to build his business. He could rest on his achievements at home, but he’s willing to trade some of his time in the here-and-now to have an easier time in the future. This is one of the areas where we can learn from King Kendrick. How, exactly, did he become a household name across the world? He has a relentless tour schedule in order to promote his work. Learn from the King and start thinking about how investing your time today can help you flex your financial future! When Forbes Magazine asked Kendrick why he didn’t endorse many products, he had a simple reply: “all money ain’t good money.” To King Kendrick, principles are important. It’s worth it to focus more on what’s important to him rather than lower his standards to make an extra buck here and there. We can learn from the King by being more purposeful about how we earn, share, save and invest our money. Many of us focus on making money. The problem is that we can spend money almost as fast as we make it. King Kendrick shows us a better way to think about how we treat money. Money should never mean compromising our values! By using the internet to connect with people who share our values or to Bank Black and Buy Black, we can build personal wealth and strengthen our community. This way, we can grow as a community instead of just growing our bank account at all cost. The best investment is in yourself and our community! We know Kendrick Lamar by many names. He’s “King Kendrick” and the “Greatest Rapper of All Time.” He’s even the “King of New York.” How did Lamar get all of these titles? It’s simple: he gave these titles to himself! This is a money lesson we can all stand to learn. King Kendrick is never afraid to build his brand in order to stand out from the competition. Whether you own your own business or you’re grinding your way up the corporate ladder, don’t be afraid to promote yourself and let others know what a great job you’re doing. This is the best possible advice for anyone looking to grow their wealth and build a better brand for themselves. Because King Kendrick doesn’t give a lot of endorsements, the ones he does offer are special. In one case, it’s also surprisingly personal. He made a deal with Reebok to release a special pair of shoes: one shoe was red and the other blue. This was his way of sharing the message that the Bloods and Crips of his old Compton stomping ground need to come together in peace. In fact, each of King Kendrick’s releases with Reebok is intertwined with a powerful message, and many of the styles harness anti-gang violence themes. What can we learn from this? For one, we can learn that money is personal and it’s powerful to invest in the things that are important to us. We can use our money, career, and business to take a leadership role and send a powerful message to the world. So, when it comes to money, don’t just bank; Bank Black with OneUnited and send a message that #BlackLivesMatter and #BlackMoneyMatters. Thanks I like what he is doing we need more people's like this . This was timely and much needed. I live in L. A. and am a customer. Please train and retain staff so that the bank operations run smoothly. It helps to make your salaries competitive so staff turnover is minimal. Thanks for listening. Is OneUnited Bank owed by Black Americans without White investors? Hi Tameia, Yes, OneUnited Bank is Black owned and managed. The majority of our shareholders are Black and the majority of our Board of Directors are Black. Thanks for inquiring. Looking forward to doing business with my people. I AM INTERESTED IN BANKING WITH BANKONE, HOW CAN I DO THIS. Banking is coming to a new era of change. Choosing to bank smarter is now, a reflection of what it means to Bank Black. I’m very interested in more talks, blogs, and interactive content in order to truly understand what direction OneUnited is headed towards while working side by side in our economic advancement. Hello OneUnited Bank: I am very interested in banking with this bank. Two areas important to me are "Fee-Free Checking" and seeing "Black people holding the Jobs" in all aspects, including "when I walk into the Bank".Also important is High-yield interest on savings and investment accounts AND ease of access.